1) Enter the Domain – This can be your/your competitors’ homepage URL. You can’t enter your inner pages URLs here. 2) Pages to be Crawled – No. of pages that you want to be crawled. Minimum 10 and maximum 10000 pages (depents on units present in your account). In case we are not able to crawl the specified number of pages, you will be getting a corresponding refund in units. a) Social Metrics – This will include social metrics like Facebook likes, shares and comments, re-tweets, linkedin shares etc. You will be charged 0.3 units/per page for selecting this option. b) Google Page Speed – This will show the page speed as determined by Google on a scale of 1-100 with 1 being the lowest and 100 being the best. You will be charged 0.3 units/per page for selecting this option. c) HTTP status & Broken Links Check – This will check the HTTP status for each link on a page along with checking if the link is broken or not. The limit for this is 50 (multiplied by) No. of pages selected for crawling. For eg – If you have selected 100 pages to be crawled, we will be checking the HTTP status for 50 X 100 = 5000 pages. You will be charged 0.7 units/per page for selecting this option. After you have filled the form, click on the ‘Crawl’ button and wait for the report to get generated. This should take between 30-180 mins (The time actually depends on the number of pages you have entered along with the options selected. In case of 10 pages, your report will be ready in max 30 mins whereas for 5000/10,000 pages, it can even take up to 24hrs). You will see the status as ‘Processing’. Once the report is ready, you will see a notification next to your name on the top-right corner. The ‘Processing’ status will now change to ‘View Report‘. Clicking on ‘View Report‘ will open your Audit report. 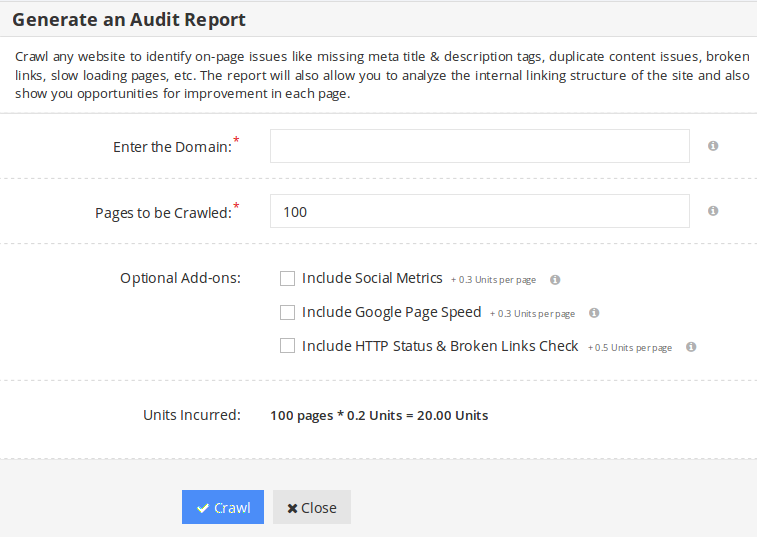 The Website Audit report consists of 8 tabs which are explained in detail one-by-one in this tutorial. 1) Domain – The domain name/website URL that you entered in the form. 2) Crawl Date – The date on which the website was crawled by our tool. 3) Pages Crawled – The total no. of pages crawled by our tool. In some cases like re-directs or less number of pages, the number will vary and might actually differ from what you entered earlier in the form. In our example, we had entered 100 pages but due to re-direct issues, we can see 102 pages being crawled. 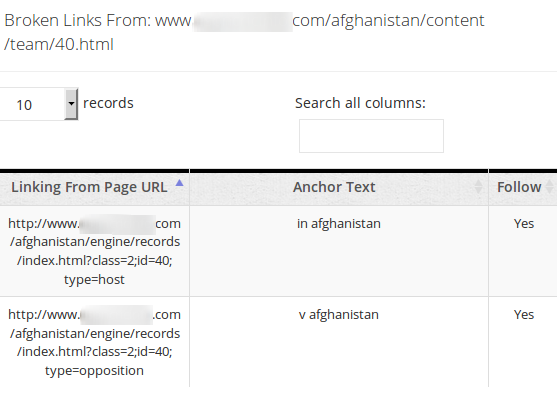 4) Page Rank – Shows the PR of the domain name entered. 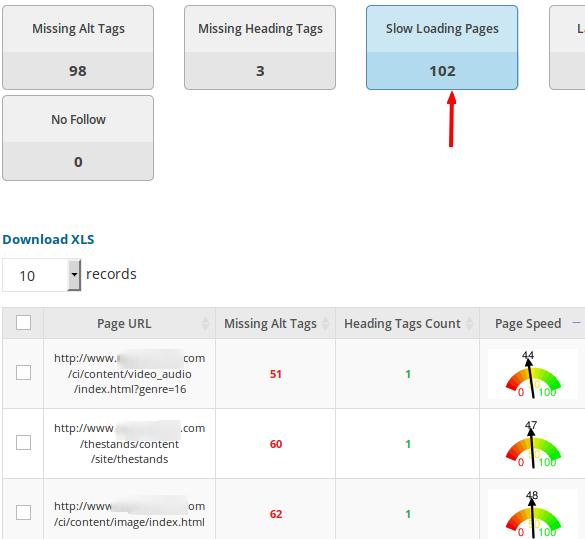 5) Page Speed – Shows the Google Page Speed measured on a scale of 1-100. Higher the page speed, better it is for the search engines as well as for people. 6) Alexa Rank – Rough measure of a website’s popularity, compared with all of the other sites on the internet, taking into account both the number of visitors and the number of pages viewed on each visit. 7) Domain Authority (Moz) – An important search engine ranking factor, domain authority is a measure of the power of a domain name. It is based on 3 factors – Age, Popularity & Size. 8) Canonicalization – A process of picking the best URL when there are several choices. Usually refers to the home pages. As the name suggests, the “Summary” tab will show you a summary of all the 8 tabs in a neat and concise format. For detailed understanding, let’s explore the remaining 7 tabs one-by-one. Meta issues pertain to missing meta titles and descriptions, duplicate titles and descriptions and long titles and descriptions. These on-page optimization tactics even though dis-regarded by some are extremely important in SEO. 1) Missing Meta Titles – Clicking on the number highlighted will show you all the URL’s where meta titles are missing (as seen in the below screenshot). 2) Missing Meta Descriptions – Clicking on the number highlighted will show you all the URLs where meta descriptions are missing (as seen in the below screenshot). 3) & 4) Duplicate Titles & Duplicate Meta Descriptions – Clicking on the number highlighted will show you all the URLs that have duplicate titles as well as duplicate descriptions (as seen in the below screenshot). 5) & 6) Long titles & descriptions – Clicking on the number highlighted will show you all the URLs that have long titles and descriptions. As you can see in the screenshot below, there are 20 URLs that have long titles. Ideal length recommended is between 50-60 characters. Also you can see 2 URLs having long descriptions whereas the ideal length recommended is between 155-160 characters (as seen in the below screenshot). The linking issues tab will show a list of all the pages with internal links, external links, broken links and re-directs. 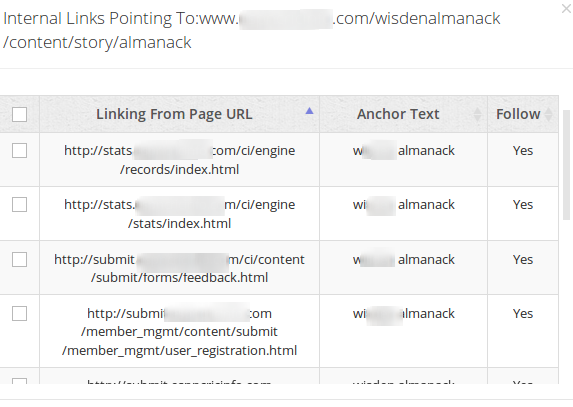 1) Pages with > 100 Internal Links – Upon clicking the number highlighted, this section will display the URLs that have more than 100 internal links. Also on display are external links and broken links on this page. Upon clicking the numbers displayed under the “Internal Links on this Page”, you can see all the internal links pointing to the first URL in the table. 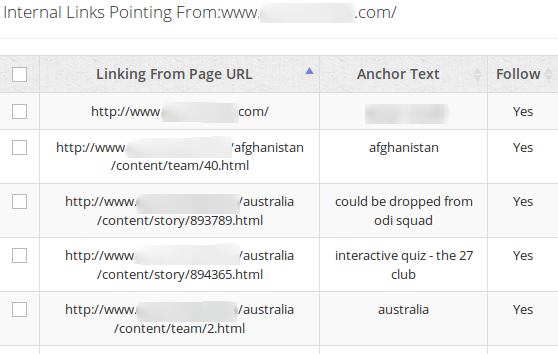 Similarly clicking on the number below it, will display the URLs pointing to the second URL in the table and so on..
On similar lines, if you click on the number highlighted under the “External links on this Page”, you can see a set of external links pointing from the first URL in the table. Similarly clicking on the number below it, will display the external links pointing from the second URL in the table and so on..
And lastly, if you click on the number highlighted under the “Broken links on this Page”, you can see the broken links from the first URL in the table. Similarly clicking on the number below it, will display the broken links from the second URL in the table and so on..
4) Re-directed Pages – Shows you a list of pages that are actually re-directs. The HTTP status of 301/302 signifies permanent and temporary re-directs respectively. Page URL – The 102 URLs or pages that were crawled by our tool. Optimized Keywords – This shows if there are any focus keywords on the page. This is calculated based on frequency of repetition of keywords, if they are mentioned in the title, heading and various other tags. Page Score – Measured on a scale of 1-100, this shows how well your page is optimized (Calculated based on On-page SEO factors). Page Word Count – The total number of words present on a page. Word Count Excluding Links – Shows the word count excluding links, if any, on the page. Duplicate Content – This shows if the page is having any duplicate content or not. Link to Text Ratio – Shows the ratio of links verses text on the pages. View Options – Herein you can opt for an on-page analysis of all the 102* pages crawled by our tool (* indicates the number of pages entered by you while filling up the audit form). This way you need not go for a separate on-page analysis of any of the 102* pages. 1) No Clear Target Keywords – Clicking on the number displayed will show the URLs that have no clear focus keywords. Ideally all the pages should have around 2-3 focus keywords but that doesn’t mean you stuff your page with these keywords. 2 or 3 references of each keyword are perfectly fine. 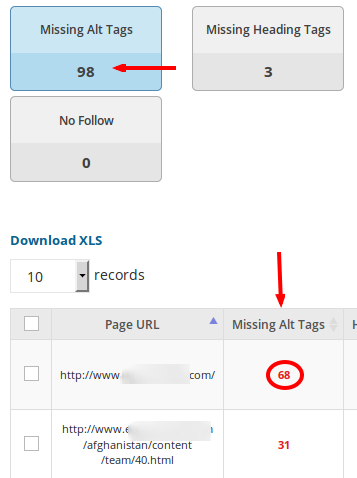 2) Poor Optimization Scores – Clicking on the number displayed will show a list of URL’s where the page score is very low. Ideally a score of more than 50 is considered decent enough. To find out, why your page score is so very low and how you can improve it, you can click on “View Onpage Details” (the last columm in the table). A separate window will open showing you a detailed on-page analysis for that particular page. Therein you can see a list of SEO factors that your site passes or fails. Working on these failed SEO factors can actually help in improving your page score to more than 50. 3) Poor Link to Text Ratio – This refers to the ratio of links you have on the page in relation to the number of words in your body. Ideally content should rule the roost here and the ratio should be less than 30% but it depends on the type of site you’re having. E-commerce sites where links are more than the content can have more than 30% link to text ratio. Upon clicking the number displayed, you will see a list of URLs where the link to text ratio is very poor or more than the recommended 30% . 4) Duplicate content – Upon clicking the number displayed, you can see the pages that have duplicate content. 5) Below 250 words – Upon clicking the number displayed, you can see the pages where the word count is less than 250 words. The ideal word count should be in the range of 400-500 words and should include a few focus keywords as well. 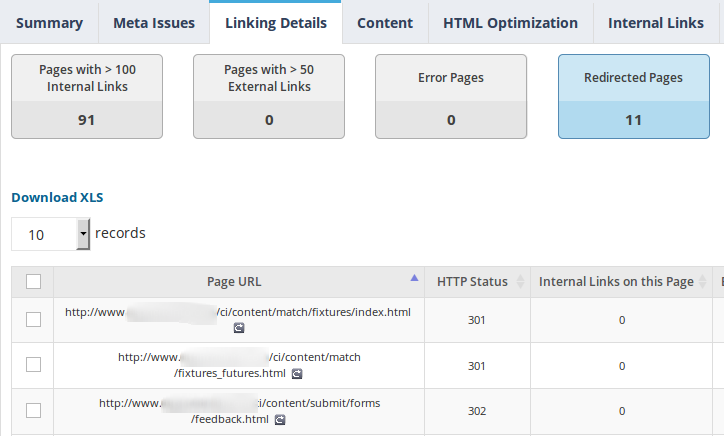 e) The HTML Optimization Tab – Next up is the “HTML Optimization” tab that deals with all the HTML related issues like alt tags, page speed, page score, page size, indexing, follow or nofollow, heading tags. The first time when you open this tab, you can see an overview which is shown in the below screenshot. 1) Alt tags – Alt tags provide a text alternative to an image. It describes the image for those who’re not able to view it properly. 2) Heading tags – In HTML, the header tags h1 to h6 form an hierarchy. So in case if you skip any of the tags says you move directly from h1 to h4, the heading structure will be broken thereby harming your on-page SEO efforts. The h1 tag is the most important tag and every page should have one. 3) Slow Loading Pages – Shows the list of pages that take ages to load. A slow loading page will increase your bounce rates thereby affecting conversion rates. 4) Large Page Size – Shows the list of pages that have large paze sizes. As stated above, a large page will take a lot of time to load thereby affecting conversions. 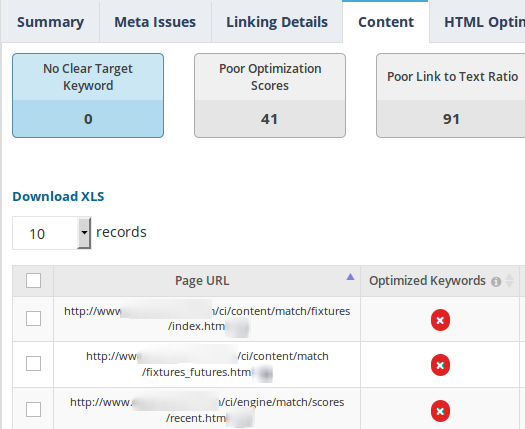 5) Low Page Scores – Page scores are measured on a scale of 1-100 are include 25 on-page SEO factors discussed in detail under the On-Page Analyzer tutorial. 6) No Index – Shows the pages that have not been indexed by search engines. 7) Follow/No Follow – Shows if the pages are follow or no follow in nature. 1) Missing Alt Tags – Clicking on the number displayed will show you all the pages where alt tags are missing. In the below screenshot, we see the first URL is missing alt tags at 68 places. The second URL at 31 places and so on. This way you can check out all the 98 URLs and add corresponding alt tags. 2) Missing Heading Tags – As seen in the below screenshot, clicking on the number displayed will show you the list of URLs where heading tags are missing. 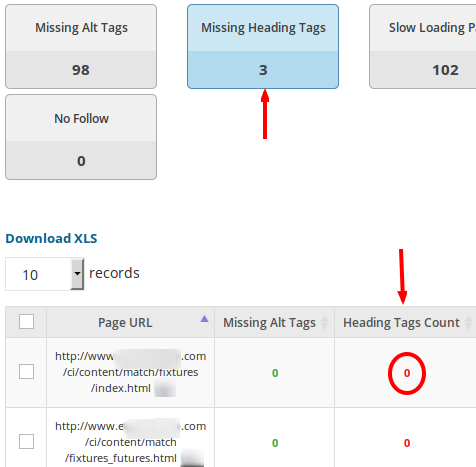 Heading tags h1 to h6 are extremely important in SEO. 3) Slow Loading Pages – As seen in the below screenshot, clicking on the number displayed will show the list of all the pages that take ages to load. Measure on a scale of 1-100, It could be either due to a slow internet connection or large page size. If not resolved, it can lead to a high bounce rate thereby affecting conversion rate. 4) Large Page Sizes – This will show a list of all the pages that have a large page size. A large page size can affect page loading times thereby increasing bounce rates and decreasing conversions and visitors. 6) No Index & 7) No Follow – These 2 tabs will display the pages that have not been indexed by search engines or are Follow/No Follow in nature. 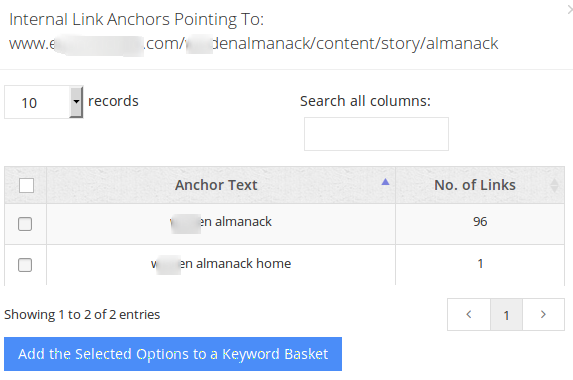 Internal links will display the list of all the pages that are linking to the URLs shows in the table along with the anchor text combinations. Under the 4th column i.e. “No. of Pages linking to this URL”, you can see 96 written. Upon clicking this 96, you can find a full list of 96 URLs that are pointing to the URL in the 2nd column. Screenshot below. Similarly for the second URL, in the 4th column, there are 91 links. Upon clicking this 91, you can find all the 91 links that point to the second URL. 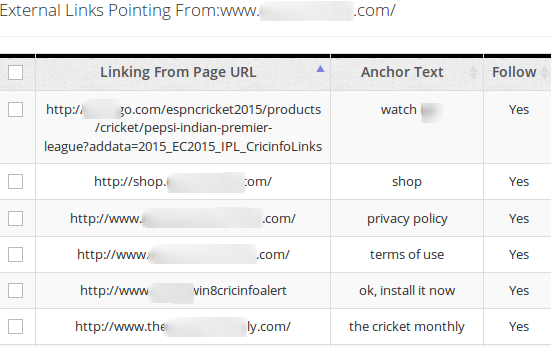 Similar to internal links, external links are the outbound links from the URLs displayed in the table. 1) Optimize your meta titles and descriptions the right way by including the focus keywords. You can run an audit of your competitor’s page and find out how they have optimized their meta titles and descriptions. You can also avoid duplicates this way and have a unique meta title and description for each and every page of your site. 2) You can optimize your content and incorporate your targeted keywords. Not only that, you can also work on having an optimal word count i.e. 400-500 words and focusing more on text than links. This way the link to text ratio will be balanced. You can also find out if you have any duplicate content issues and work towards resolving it. Content is king and search engines love fresh, crisp content. 3) Improve your linking structure – You can work towards perfecting your internal/external linking structure by linking all the relevant pages together so that it forms a chain and becomes easier for visitors to navigate. Apart from that, you can also use diverse anchor texts for building SEO-friendly links. Remember Google as well as other search engines love a good UX (User Experience). 4) Social Metrics – Social media is one area which you can’t ignore and also Google considers social signals as ranking factors. From the stats obtained, you can work on having a killer social media strategy for all/some of your pages and work on creating share-worthy content. This can include videos, text updates, infographics, articles etc. 5) HTML Optimization – You can find out the pages that have missing alt tags, heading tags, slow page speed, large page sizes and work towards correcting these pages. These are some important SEO factors which can definitely boost your visibility in SERPs as well as ensure a low bounce rate and a pleasant user experience. You can also run a complete website audit for your competitors’, understand their on-page, linking and content strategy and then come up with a robust plan of action. So, what are you waiting for? Login now to your Mondovo account and start using the Website Audit tool to boost your SERPs as well as increase visitor conversion rates. Why Should I Use Mondovo?